We all love an interesting, useless fact, don't we? They come in handy for random pub quiz questions and let's face it, they're just fun. How many of the below five can you say you knew before reading this infographic? We're guessing only some of them. Some of them are downright dangerous and some of them are mind-blowing. So next time you're taking part in a pub quiz or a game of some kind, and a random car question pops up - you'll be well-equipped to answer! 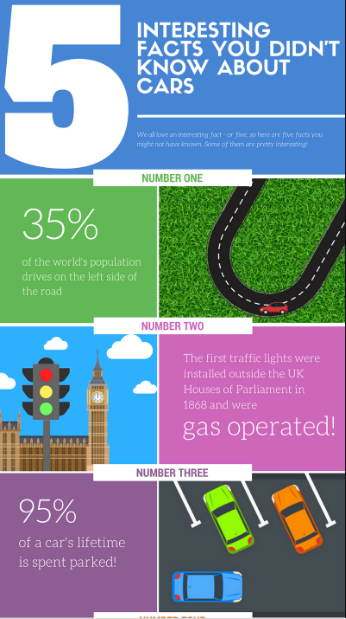 This vibrant infographic was created by Money4yourMotors.com - the UK car buying service who will buy any car! We come to you to buy your car and you receive instant payment for your car before we leave! Get your instant free quote today to start your car selling journey.